Snicker, my 5 year old bay gelding has never been shod. I bought him when he was 2 years old and knew that I wanted to try and keep him barefoot, as I could never understand how having iron shoes nailed onto a horse's foot could be of benefit; except perhaps to offer some kind of protection on rocky ground. I bought Snicker from a friend and continued to keep him at her place, where he was living out 24 hours a day in a field with 5 other horses, with access to a field shelter. 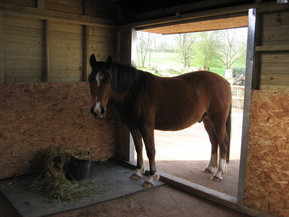 In the harsh winter months he had the use of a stable at night. His feet were trimmed by a farrier every 6 weeks, but despite this he had quite severe cracks appearing in his feet until eventually his left hind had a crack virtually the whole way up the hoof wall. After about a year I moved house and therefore moved Snicker to a livery yard nearby. He had the most beautiful 12x12 stable and plenty of turn out in the day, but unfortunately the environment surrounding the livery was very stony and wet, and it wasn't long before Snicker was showing signs of weakened and bruised hoof structures and was struggling. As a consequence he was quite nappy in his behaviour and was refusing to go forwards over stony ground. It was at this point that I decided to do some further research and looked more into the whole process of barefoot. Lindsay Cotterell DAEP was a name that was recommended to me. Lindsay was a qualified Applied Equine Podiatrist with the institute of Applied Equine Podiatry founded by Dr. KC La Pierre. 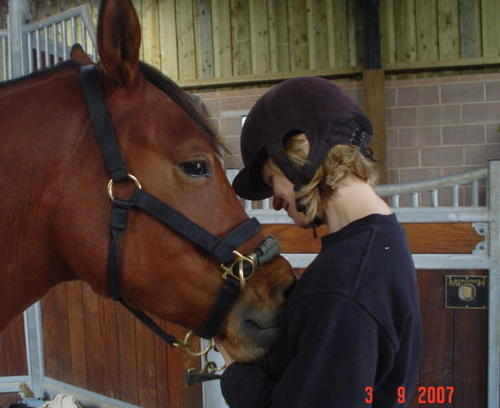 She had also completed many of the Intelligent Horsemanship Courses - `Perfect'! I contacted Lindsay straight away and she immediately suggested a plan of action. Firstly, I bought Snicker some boots to protect his feet whilst hacking out, and then I bought some Solemate Theraputic Pads which I cut to fit inside the boots. The pads moulded to the shape of his feet aiding the return of proper function, whilst supporting weakened structures when used in conjunction with the appropriate exercise, preventing further trauma. Every day I either walked him out in hand in the boots and pads, or rode him in them for 20 minutes. I also made sure I picked out his feet twice a day, applying Colloidal Silver spray and zinc oxide cream to help create a healthy environment. Lindsay visited and trimmed Snicker's feet with the High Performance Trim Method every 4 -5 weeks. Over the months Snickers feet began to improve. His cracks began to seal and he was much more forward going, but we still knew that he would have a struggle in this environment, as there was no real foot conditioning surface available. 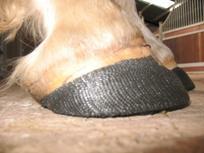 As a temporary tool Lindsay suggested applying the `Perfect Hoof Wear'. It can be used as long as you have trained your horse to stand still! It basically looks like a black bandage; it is very light and sets using water. It moulds to the hoof but allows for distortion on all dimensions of natural movement which a shoe cannot do. This ingenious invention from KC La Pierre allowed us to maintain the improvement that we had worked so hard to achieve, until a more suitable enviromnent could be found for Snicker. Eventually I was lucky enough to rent some land directly behind my house and was able to make a purpose built foot conditioning surface area. After discussions with Lindsay and being guided by Snicker's `Spectrum of Useability' (an ongoing record of assessment of Snicker's hooves),we set about providing an enviroment that would be conducive to healing and maintaining health. An area measuring approximately 75 ft by 35ft was erected directly on top of an old existing hard base, which was broken up somewhat in places, with grass and weeds growing through and over it. I filled in the gaps with some larger stones and then put down a membrane over this which allowed for water to pass through, and then 12 inch stakes were hammered 6 inches into the ground at equal distances, all around and to which 5 inch boards were then screwed to. This created an edge to hold the surface in. I was lucky enough to be able to use an existing hard base but if this was not the case then I would suggest (subject to obtaining any necessary planning consent) putting down approximately 4 inches of type one sub-base and then spreading this out evenly, packing it down firmly using a `wacker plate'. On top of this I would then suggest laying another layer of membrane to stop any of the larger sub-base stones from working their way to the top. Although if this was the case, then the stones would easily sink through the 6mm to dust layer on contact with the horse's foot, avoiding any pin point pressure on the hoof. Finally, 2 inches of 6mm to dust stone was spread evenly over the top and packed down firmly. 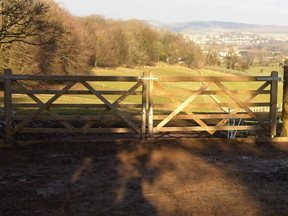 Post and rail fencing was errected to contain the surface area and a pedestrian gate added at the side for easy access, and a larger gate fitted to allow the horses direct access onto their fields. Generally I encourage Snicker and his buddies (also barefoot) onto the surface for 8 to 12 hours a day, but this varies according to weather conditions and the time of year. They usually use the surface overnight in the winter, an during the day in the spring and summer, sometimes with the gate open so they can decide themselves, if the weather is particularly good. 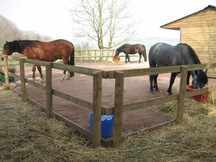 It can also be used as a 24 hour all weather turnout area; especially useful for controlling weight in the spring, or for safe turnout on frosty or ground freezing days where the going is dangerous. It is also great for looking after the fields when it is wet and muddy by giving the ground a chance to rest. A great bonus is that the surface is really easy to poo pick with a shavings fork and means that you have less poo picking to do in the field each day, which is much harder work! I have made many hay feeding and water stations on the surface to encourage movement, and a small area of wood bark chippings to encourage them to urinate in one place, which works really well. 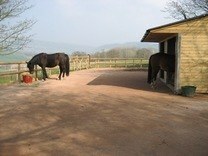 I put down a number of rubber mats as well to give them the choice to either lie down or stand on something softer. They also have an 18ft by 12ft field shelter on the surface as well. I would like to stress at this point that if your horse/pony is just coming out of shoes and making the transition to barefoot, or is already barefoot but not with very hardened or conditioned feet, that the time spent on this surface type should be built up very gradually. I was able to put Snicker straight on there for quite long periods of time at the start due to his feet having been conditioned by `the perfect hoof wear' wraps, but generally you would start by introducing it to their feet for 30 minutes and then 1 hour, gradually building up the time from there. If this is not possible to do then you can always put more rubber matting down and gradually remove the mats one at a time as the feet become more hardened and used to it, but a DAEP with the horse's `Spectrum of Useability' record sheets would be able to offer the correct guidance as to how much the horse/pony can cope with initially. I am not sure what I would do without the surface now as it has helped so much to condition and exfoliate Snicker's hooves, and with Lindsay looking after his feet for the past two and a half years, they have gone from strength to strength. I am indebted to Lindsay for all her commitment, inspiration, dedication and kind ways with my horse and for always being so helpful and understanding. Snicker's cracks have all sealed up and I no longer need to do 'pad walks' as the surface does all the hard work for me, and he no longer needs boots to hack out in. He copes well with road work of which I do a minimum of 20minutes 3 times a week and ride as much as work commitments allow. I envisage that Snickers feet will continue to go from strength to strength. I now realise that the environment, combined with correct hoof balance, is what provides the correct stimulus to optimise a return to a healthy foot; the crucial deciding factor as to whether a domesticated horse has a fair chance of succeeding barefoot. I know that a lot of people think it is just a cheaper option not to have traditional shoes on their horses' feet, and tend to `give it a go' by simply removing the horses' shoes, and leaving their horse in a soft, wet, muddy field. This invariably creates problems for the horses' feet which become weak and vulnerable to infection, and so they give up. I can honestly say that it was a great deal of hard work initially for me, trying to cope with improving Snickers bare feet in a traditional environment; but through research, education, determination and commitment I believe I have found a great way forwards for both Snicker and myself, optimising the time we spend together.